People for the Ethical Treatment of Animals announced plans Monday to run a billboard near the U.S.-Mexico border that parallels the separation of migrant families with the separation of cows at dairy farms. If you read the whole article it says to switch to soy. soy contains a form of estrogen that is really bad for males and females too. in males it causes muscles and gentiles to shrink, hair loss, depression and mood swings specifically anger. in females it is known to cause certain types of cancer. soy is recommended for older women who have low estrogen. dont drink/consume that poison. its a common food of those who support extreme left ideas/agendas. even antifa. there are some videos on youtube where some one shows twitter posts and clips of youtube videos of antifa members and other heavy leaning leftists they posted showing they consume lots of soy, even pictures inside their fridge. any knowledgeable body builder will not touch that stuff. not to mention its one of the most Genetically modified food sources out there. But just look at the facts here in this article, a group that supports illegal activity and thinks animals, specifically cattle, are equal to humans say to drink soy. If you dont want to drink cows milk then dont but soy is way worse for you. Do your homework and see. As far as peta showing cattle are equal to animals, well i do not even want to comment other than their efforts are in vain. most people in that area cant read english, the ones just passing thru anyway. There is a push to get rid of cows. I see articles fairly often pushing eating bugs as sustainable protein and eliminating cows. Then I see articles claiming that cows produce methane, greenhouse gas, global warming, the sky is falling etc. there are other commie agendas to try and eliminate all livestock, including heritage breeds. this includes chickens, turkeys, goats, pigs, any livestock really. its just to control the food supply. which would work out really well for someone if you wanted to impose that everyone took a mark of some kind and could not buy sell or trade without said mark. there is a push to make it illegal to keep back seeds to grow crops too. they are going to have a tough time getting ranchers to get rid of their cattle without bloodshed. there was almost some major stuff going down a little while back over cattle grazing a particular land. But the main thing to consider here is this. Humans produce methane in the same way cows do, so where will they stop... especially if they already view cattle and humans to be equal. I feel like PETA had a purpose at some point in the past, but now it's just posing naked in public like a Thanksgiving turkey, or this, comparing people to animals and going on and on about veganism. We aren't supposed to eat our livestock? The livestock is what produces methane gas, though. If we aren't eating them, then they're just going to keep on farting and making the temperature all the more humid. There is nothing natural about this flatulence; we should force the cows to take alka-seltzer. Have you ever been around cows? where i live cows are in every direction from my house for so many miles your vehicle will run out of fuel before you stop seeing cattle. cows ripping it is not causing humidity or it to get warmer. yes they have gas, but this idea is just as crazy as them saying worms are causing global warming, worms been around a long time now and its just now causing it to get hotter???... just as crazy as them saying Co2 gas is a greenhouse gas... which is produced from decaying forest floor, one of our biggest sources is the rainforest. dont believe the lies to push their agendas because they are full of more than hot methane. You'd think the protesters would be up in arms about this. Sounds like an insult to me. Let's face it: without PETA, there would be a lot of liberal vegetarians and vegans without a banner to wave in folks' faces. Not to mention that they get 33 million a year in donations (and 2 million in sales of merchandise), yet say that they gave "$843 thousand in grants to researchers looking at animal alternatives" (That sounds like a lot until you compare it to the 33 million). That's 2 percent of their donations, as opposed to 17 percent spent on fundraising. So they are getting a ton of money to essentially harass people for eating meat. I wonder how much of that goes to paying folks who sit in an office drinking soy-milk lattes? They probably also pay "professional protesters" to protest for them! I think most people have jobs and are too busy to protest....trying to put food on the table and pay the rent. Who has time to protest? 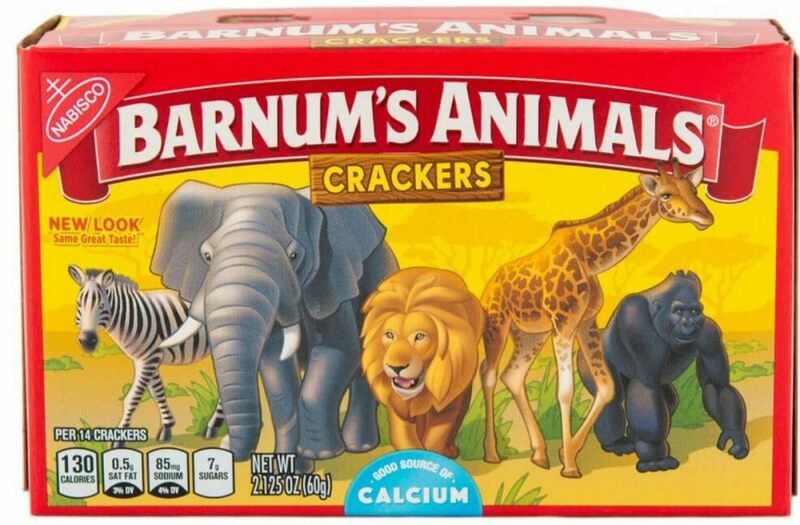 PETA didn't like the animal cookies behind bars. They wanted them cage free and got their inordinate wish. I hope they don't read this, next thing they'll want will be plant crackers, as People are Eating Tasty Animals. "PETA Executive Vice President Tracy Reiman says she's celebrating the box redesign for the cultural change it represents. 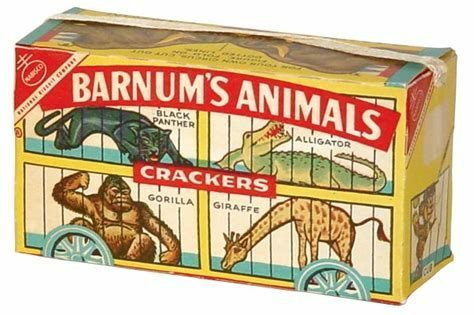 "The new box for Barnum's Animals crackers perfectly reflects that our society no longer tolerates the caging and chaining of wild animals for circus shows," she said."